Lisbon is located on the broad Tagus River. The exceptional port created by the Tagus, and the proximity of the Atlantic are substantial influences on Lisbon. The early Portuguese voyages of discovery departed from Belem immediately to the west of Lisbon. Portugal is situated far enough south so that the sun can be brilliant in Lisbon. The ocean off the Portuguese coast is also unusually clear giving this vicinity some of the most attractive beaches in Europe. Port Lisboa, ancient Olisipo, capital of Portugal, of Estremadura prov., and of Lisboa dist., on the Tagus River where it broadens to enter the Atlantic Ocean. Lisbon is Portugal's largest city and its cultural, administrative, commercial, and industrial hub. It has one of the best harbors in Europe, handling a large trade. Agricultural and forest products and fish are exported. The city's industries include the production of textiles, chemicals, and steel; oil and sugar refining; and shipbuilding. A large transient and tourist trade is drawn to Lisbon, which is set on seven terraced hills. The Castelo de São Jorge, a fort that dominates the city, may have been built by the Romans on the site of the citadel of the early inhabitants, who traded with Phoenician and Carthaginian navigators. The Romans occupied the town in 205 B.C. It was conquered by the Moors in 714. The city's true importance dates, however, from 1147, when King Alfonso I, with the help of Crusaders, drove out the Moors. Alfonso III transferred (c.1260) his court there from Coimbra, and the city rose to great prosperity in the 16th cent. with the establishment of Portugal's empire in Africa and India. Although many of the old buildings were destroyed by earthquakes, particularly the disastrous earthquake of 1755, some of the medieval buildings remain. The old quarter, the picturesque and crowded Alfama, surrounds the 12th-century cathedral (rebuilt later). The new quarter, built by the marquιs de Pombal after the great earthquake, centres about a large square, the Terreiro do Paηo. Some of the well-known buildings in and near Lisbon are the Renaissance Monastery of São Vicente de Fora, with the tombs of the Braganza kings; the Church of St. Roque, with the fine Chapel of St. John (built by John V in the 18th cent. ); and the magnificent monastery at Belιm, on the north bank of the Tagus facing the sea, built by Manuel I to commemorate the discovery of the route to India by Vasco da Gama. Camões was born in Lisbon. The Univ. of Lisbon (originally founded 1292, but transferred to Coimbra in 1537), was re-established in Lisbon in 1911. In 1966 the Salazar Bridge, one of the world's longest (3,323 ft/1,013 m) suspension bridges, was completed across the Tagus, linking Lisbon with the Setual Peninsula. Bibliography: see David Wright and Patrick Swift, Lisbon (1971). Modernization is beginning to make Lisbon look more and more like the rest of West Europe. In the last decade or so, many new high rise buildings have been constructed around the edge of the city. Lisbon has, however, still retained much of its past. Lisbon's downtown area has a quality that has not changed much for generations. Visiting Lisbon is an adventure in traditional surroundings. Many young people prefer Lisbon because of the city's low prices and because of Portugal's reputation for providing a successful holiday. The squares in the centre of Lisbon create a pleasing downtown area. Most of Lisbon was destroyed by a severe earthquake in the 1700's. When the city rebuilt, the downtown area was planned around several important squares. The Lisbon of a century ago can still be seen in the vicinity of these squares. Lisbon's squares are still focal points for activity in this city. The buildings, people, and various goods being sold here all help make Lisbon a pleasing, distinctive city unhurried for several generations. All these reasons combine to make Lisbon a pleasant, if somewhat unusual, city. Most of the summer months, Lisbon remains a lazy and very nice place. Lisbon is far removed from Europe's bustle. Lisbon has unusual qualities that simply bring out a festive holiday mood in people. While in Lisbon, do not miss the modern changes that have been made in the city. The last fifteen to twenty years have built a contemporary Lisbon. Away from the city centre, modern high rise building are evident everywhere. The old now blends with the new in Lisbon effectively convincing the visitor that the city has joined modern Europe. Lisbon's links to the past are less significant than they once were. Traditional qualities are carefully protected in the centre of Lisbon. The city has succeeded in retaining last century's charm in the downtown area. Streets and plazas seem adapted to a slower time than the present. The centre of Lisbon is said to offer about the same pleasant view of Portugal's capital as several generations ago. Lisbon does have an efficient public transportation system and one need not walk everywhere. Lisbon's subway connects the downtown with other areas of the city. Buses extend public transportation into areas of Lisbon that could not otherwise be reached. All areas of Lisbon are reachable using both the subway and buses. Ferry Buses at the Praco do ComericoMost of Lisbon's tourist attractions are found on the north banks of the Tagus. Here is where Lisbon's traditional city is found. Lisbon reaches right to the Plaza Comercio located directly on the Tagus. Ferry boats for across the river leave from the Plaza Comercio. The De Abril Bridge across the Tagus is visible throughout much of Lisbon. The entrance to the bridge is roughly a mile away from the river. Four lanes of traffic move up the approaches and on to this suspension bridge. The De Abril Bridge is high enough above the Tagus to allow Lisbon's shipping to enter the harbour. On the south side on the Tagus, the highway continues onto high cliffs. A statute of Christ with outstretched arms high on the southern bank dominates the south side of the river. This statue is visible from most of downtown Lisbon. Leaving the centre of Lisbon on foot is not possible because there is reasonably heavy vehicle traffic and long distances are involved. Public transportation is, however, available west along the Tagus. Several of the city's famous attractions are found to the west of the Tagus bridge. The oldest areas of Lisbon are found walking west from the Tagus toward the centre of Lisbon. Streets here are laid out in regular city blocks for about six or seven blocks. This old district is one of the best kept areas in the city. Shopping is fascinating throughout this area, and places to find refreshment are similarly in abundance. Traditional Lisbon can be found here. The Plaza Rossio area itself has open air flower markets and various kinds of vendors. Those qualities that have thrilled Lisbon visitors for generations are found here. Begin Lisbon's urban hike in Eduardo VII Park. The Rotunda Subway Stop is adjacent to Eduardo VII Park. After looking at the park, proceed south on the Avenida da Liberdade toward the Tagus River. The Avenida da Liberdade provides a glimpse of fashionable Lisbon. Several blocks toward the centre of Lisbon, turn right on Rua do Salitre and find a botanical garden. After seeing the botanical garden, return to the Avenida de Liberdade and continue toward the Tagus. In a few blocks, reach the Praca dos Restauradores. This is a pleasing plaza surrounded by a neighborhood that deserves some exploring. After looking around here, continue toward the Tagus on the Avenida de Liberdade. Next, reach the Praca do Pedro. Shops of various kinds and places to have refreshment are found here. There are also flower sellers and other reminders of traditional Lisbon. Next, follow the street on the south side of Praca do Pedro east.Twisting little street lead up hill from here. Castelo de Sao Jorge is located at the top of the elevation. An urban hike in Lisbon Castelo de Sao Jorge was originally a Moorish fort overlooking Lisbon. The view from the castle is superb. Lisbon's harbour, the south side of the Tagus, and the downtown can all be seen from this vantage point. Castelo de Sao Jorge's is an exceptional place to visit. Several types of fowl are found in the castle's inner court yard. The castle's outer perimeter has trees planted that provide shade and allow an opportunity to savour the view of Lisbon. After finishing with Castelo de Sao Jorge, return to the Praco do Pedro. From here, follow the Rue da Prata for several blocks to the Praco do Comercio. This plaza has one side on the Tagus. Lisbon's Praco do ComercioCatch a westbound bus for the National Museum of Art. This museum provides a remarkable sense of what Lisbon was like when Portugal was a great power in earlier centuries. Articles of gold can be seen at this museum made from gold returned from lands discovered by Portugal. Continue west by bus to Belem. Several important tourist attractions are found here. Ask the bus driver where to leave the bus for the National Museum of Coaches at the Praca Alfonso de Albuquerque. This museum contains an extraordinary collection of royal coaches, one of the richest such exhibitions anywhere. Next, walk a few blocks to the west and look at the Mosteiro de Jeronimos. This late Gothic monastery is an inspiring example of a Manueline building. The cloister behind the church is a naval museum decorated with sea beasts, ropes, anchors, astronomical instruments, coral, and seaweed all exemplifying the Manueline style of architecture. After looking and the Mosteiro de Jeronimos, cross the Rua da Junqueira and the Avenida da India to the Monument to the Discoveries. This modern monument, sometimes called the Henry the Navigator Monument, was built to commemorate the early Portuguese voyages of navigation. Situated next to the Tagus, the Monument to Discovery has a superb view of the de Abril Bridge and south across the Tagus. The Monument to the DiscoveriesFrom here, continue west on the Avenida da India. A Folk Art Museum is situated directly to the west. The Tower of Belem is situated further west. Built out into the Tagus, itself, the Tower of Belem is an admirable reminder of Portugal's past. The Tower of BelemAfter looking at the Tower of Belem, take the bus back to the centre of Lisbon. Walk from the Praco do Comercio to Praco do Pedro, and take the subway to the Pequeno Station. The Campo Pequeno Bullring is located at this subway stop. In Portuguese bull fights, the bull is not killed in the ring. Bull fights are held at the Campo Pequeno Bullring during the summer months on Sunday and sometimes on Thursday. After looking at the bullring, take the subway to the San Sebastiao subway stop. The Gulbenkian Museum is located here. Donated by the oil magnet of the same name, this museum includes a museum, concert halls, a library, and a gallery for temporary exhibits. The permanent collections includes several Rubens and Rembrandts. Next, return to the Rotunda subway stop. From here take a bus to the Amoreiras Shopping Centre located on the Avenue Durate Pacheco. The Amoreiras Shopping Centre concludes Lisbon's urban hike. There are shops here with merchandise of different kinds and bistros that provide refreshment. Lisbon is famous for having preserved the charm of earlier generations. Plan enough time to thoroughly discover Lisbon's downtown area. The side streets surrounding the Praco do Pedro are among the most enthralling to explore. To find Lisbon, allow enough time to discover the city. Lisbon is an important sea port. When planning to visit think some about Portugal's past. The famous explorers all left on their voyages of discovery from Lisbon. Memories of the days when Lisbon was one of the world's great cities are everywhere. 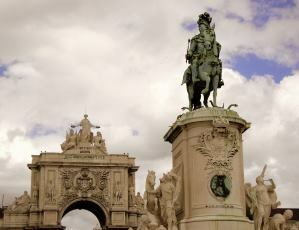 Learn a little about Lisbon's past, a visit here becomes more exciting. Photographing Lisbon helps capture the attractiveness of this somewhat unusual city. Lisbon's proximity to the sea and the southern latitude produces advantageous days for photography. This lazy city sits in the sun along the banks of the Tagus inviting expert photographic efforts. Lisbon is, also, a city of unusual vistas including the Castelo de Sao Jorge and the Christ statue on the south bank of the Tagus. Taking photographs in the centre of Lisbon allows catching the traditional charm of the city. Lisbon is traditionally famous for leather goods, porcelain, jewelry, and various kinds of local handicraft. Businesses selling these types of goods are not abstruse to find. Shopping adds significantly to being in Lisbon. Prices can also be attractively low in Lisbon. Lisbon remains one of Europe's more distinctive cities. While there are significant signs of modernization, Lisbon has strived to maintain those qualities that made this city popular to earlier generations. Finding Lisbon attractive and friendly is uncomplicated and visiting here should not disappoint.